Let's face it, we can all do the big entrees in our sleep. However, one thing I think we all struggle with are side dishes. I know this is going to blow some of your minds, but this kitchen wife CANNOT live on mashed potatoes alone. One of my favorite quick and easy go-to's are my Weeknight Lima Beans. 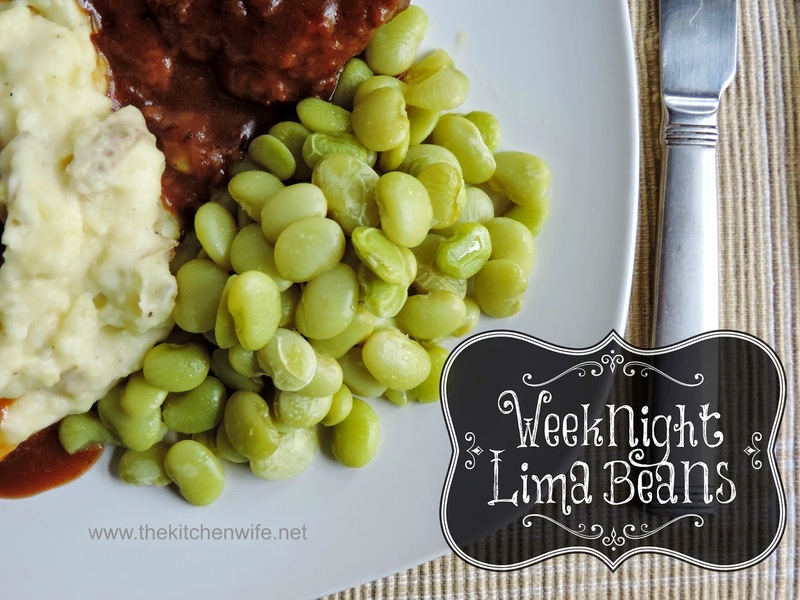 The reason I call them weeknight lima beans is because I use frozen beans. I know, I know, it isn't "from scratch", but I am just bypassing the long soak and cook, and they are MUCH better for you than the mushy canned ones. Not to mention I pack them full of flavor. To a medium sized sauce pan, pour in your lima beans (yes, mine were thoroughly frozen) and add the butter and seasoning salt. Next pour in your chicken stock. Place over a medium/high heat and bring to a boil. Lower to a simmer, cover, and let cook for 10 minutes. Taste for seasoning and add any salt and pepper you feel it needs. A perfect weeknight side dish that will go with just about anything! So give these underused veggies a try tonight! To a medium sized sauce pan, pour in your lima beans and add the butter and seasoning salt. Place over a medium/high heat and bring to a boil. Lower to a simmer, cover, and let cook for 10 minutes.